This topic comparing Stocks and Mutual Funds is focusing on churning money in a short span of time. These avenues can be used for getting returns on investments either quickly or can be held for a long period of time. A stock indicates owning a share in a Corporation representing a piece of the Firm’s assets or earnings. Any person who is willing to make contribution towards the capital of the company can have a share if it is available to the general public. On the other hand, a Mutual Fund involves pooling in small savings of various investors and accordingly invest in the stock market to garner returns on the initial investment. These investments can be made in stocks, bonds or a combination of multiple securities as stated in their Prospectus. Let us have a look at their differences with a deeper understanding of these avenues of investment. Below infographics details the differences between stock and Mutual funds. A stock is a collection of shares owned by an individual investor indicating their proportion of ownership in the assets and earnings of a Corporation. On the other hand, mutual funds are a pool of money from a number of small-scale investors which is further invested in a portfolio of assets. These include equity, debt or other money market instruments. The performance of the stock depends on the overall performance of the company in which the investment is made and the sector. Various macroeconomic factors can have a direct impact. Mutual funds’ performance depends on the macroeconomic factors but the skills of the fund managers and the pool of securities can help in maintaining stable and regular returns. The strategies of stocks are determined by the Board of Directors and can change according to the prevailing conditions and the skills of the directors whereas in Mutual funds the rules and regulations have been stated as per the Red Herring Prospectus. It is essential to follow the rules as per the prospectus since the aim is to beat the returns offered by the market without having any impact on the principal amount invested. Stocks represent ownership stake to the investors whereas Mutual Funds offer fractional ownership to the overall basket of securities. The investor is individually responsible for the management and administration of the stock or can be done by appointing a stockbroker. Conversely, mutual funds are managed by a professional fund manager on behalf of the investors. Risk component in case of stocks is larger as the direction of investment is in a single company whereas Mutual funds offer the benefit of diversification thereby offering robust earning opportunities in case of failure in a single company or sector. The trading of stocks can take place at any time during the day including intra-day trading at the existing price whereas mutual funds are traded only once a day probably at the end of the day basis which the NAV is finalized. The individual share price of the stock is multiplied by the number of shares determining the value of stock held by the investor. On the other hand, value of mutual fund can be computed by arriving at the NAV which is the total value of assets net of expenses. Stocks get regular returns in the form of dividend earned and can vary depending on the performance of the firm and decisions taken by the management. Mutual funds aim to offer regular dividends to the investors and more than that offered in the market. They also provide a timely statement on the performance of the overall fund which helps investors in decision making. The stockholder is directly responsible for the returns in the stock market as the investor is directly managing the same whereas the fund manager is not directly responsible for the results. However, their personal increment and commission does depend on the funds they are managing. Meaning Bunch of shares held by an investor indicating ownership in a Corporation Fund operated by a AMC (Asset Management Company) pooling in funds from investors and investing in a portfolio of assets. Final Investment Directly in the stock market In the fund through which investment is directed. Commission Paid when a stock is traded These can be in the form of load or no-load. The commission can be paid either at entry or exit or both the times. Whether making an investment in Stocks or Mutual fund is a completely personal decision, one should understand the pros and cons associated with each of the avenues. Both these options are suitable for small-scale investors with limited investments. Though stocks provide the opportunity of directly investing in the stock market, one needs to keep a regular track of the performance to decide the future course of action. The risk and rewards are completely borne by the investor. On the other hand, mutual funds provide the cushion of diversification in the basket. This is helpful as the risk gets spread out and in case one sector is going through a difficult phase. In addition, these funds are managed by professionals within the ambit of strategies committed and hence the investors can be relieved of constant monitoring of the investment. Thus, depending on the risk-taking ability and term of investment, the investors shall consider either of the opportunities or can consider both opportunities. The aspect of duration also has to be considered since both stocks and mutual funds can be held for short, medium or long-term. 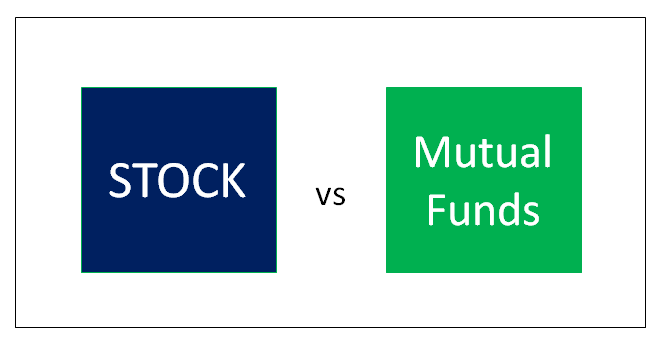 The post Stock vs Mutual Funds | Top 8 Differences (with Infographics) appeared first on Learn Investment Banking: Financial Modeling Training Courses Online.